University of East London (UEL) boxer Lawrence Okolie insists he is confident and physically ready as he embarks on the most important mission of his life this week – to qualify for the Rio Olympics. After a triumphant GB Lionhearts debut in January, the Hackney fighter has been selected by GB Boxing for the first Olympic qualifying tournament in Samsun, Turkey, from April 9-17. Okolie, 23, will qualify automatically for the Games if he finishes in the top three in his heavyweight (91kg) division. “My preparations have been good,” he said. “We’re all being pushed and are training hard. My mind is firmly on the event. 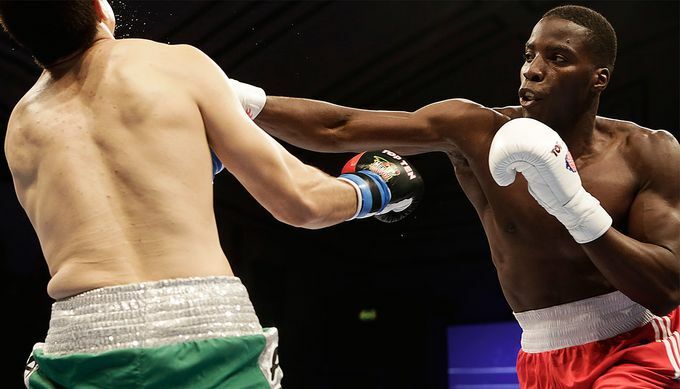 Okolie has been studying for a degree in Psychosocial Studies at UEL but, with the university’s agreement, has deferred his studies to concentrate on qualifying for the Olympics. He is currently training full-time in Sheffield with the rest of the senior GB Boxing squad. Just to be in contention for an Olympic place is a remarkable achievement for Okolie, who only took up boxing six years ago with the initial aim of losing weight. Since then, he has dropped six stone. Despite his relative rawness, he demonstrated his huge potential when he made his debut for the GB Lionhearts in Miami in January and won a split decision over American star Cam Awesome. His giant 6ft 5in frame offers him a significant reach advantage over most opponents. “Fighting for the GB Lionhearts set me up great for this year as I’m quite inexperienced when it comes to internationals,” Okolie said. Okolie is a product of UEL’s acclaimed sports scholar programme and one of a number of UEL students with high hopes of competing in Rio. Swimmer Aimee Willmott will be looking to secure her Olympic place this month when she competes at next week’s British Championships in Glasgow. Track sprinters Bianca Williams and Shannon Hylton, judoka Emmanuel Nartey and Paralympic shot-putter Vanessa Daobry are also aiming to represent the country in Brazil. Okolie said, “UEL helped me with my strength and conditioning, with access to top physios and support staff, making me a better-rounded athlete. Okolie says it would be the proudest achievement of his life to pull on a Team GB vest at the Olympics.